Located just outside of Washington D.C. is Stratford Park in Arlington, Va. This 3.8-acre park received its first major update since it was established over 50 years ago. This park was renovated to include a Little League baseball and softball field, tennis courts, basketball court, and an all-purpose field. Updates also include walkways from the neighboring H.B. Woodlawn School, so children can have access to the fields. The park also provides plenty of parking and allows the community to reserve fields. This park was renovated to upgrade its aging facilities to meet current standards. Part of this renovation included adding a shade structure with a “wow” factor. Since Stratford Park is small and only has one shade structure, it was important that the design add a signature and iconic element to the park. 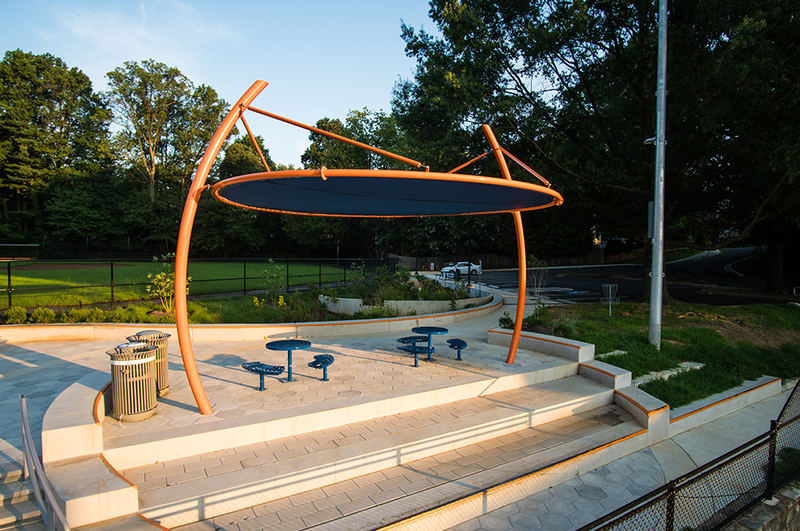 In partnership with Landscape Architect Brian Cipriano with Gordon and President of Metro Recreation Michael Slifer, shade manufacturer Superior Recreational Products was able to design, manufacture, and install a unique shade structure. Arlington County requires all of their parks to have some kind of shade, either by a pavilion or shaded seating area. Having shade structures in outdoor spaces is ideal for protecting park-goers from the sun’s harmful UV rays, wind, rain, dust, and noise. “Because Stratford Park is located within an affluent area, they didn’t want just any kind of shade structure,” Slifer said. For this park, the county hired a landscape architect and challenged him to design a shade unlike any other. Cipriano worked with Superior’s design and engineering department to make this unique shade a reality. “I think the design of this shade was intended to complement the baseball field because it’s an important part of this park,” Slifer said. Named the Halo Disc Shade, this structure combines eye-catching aesthetics with durable and long-lasting construction. This round shade features a modern, slim design with a unique architectural look. The slim fabric disc is securely laced to a steel ring, which is supported by two curved columns that create a bold architectural statement. This shade is centrally-located within the park between the baseball field, basketball court, and park entrance. It covers a picnic area within a beautiful hardscaped space. Even though this is a small park, this shade provides a big impact. “The park itself is small, so there wasn’t much room to create a big structure,” Slifer said. Since the look of this shade is so unique, it creates an impressive focal point for locals and visitors. The beginning concept plan for the park renovations started in 2015 and was completed in 2018. The shade was installed in April before the park opened. Since the footers were poured by the contractor, installing the shade only took two days. “[The shade] couldn’t have been easier to install. And that’s the real trick with shade,” Slifer said. 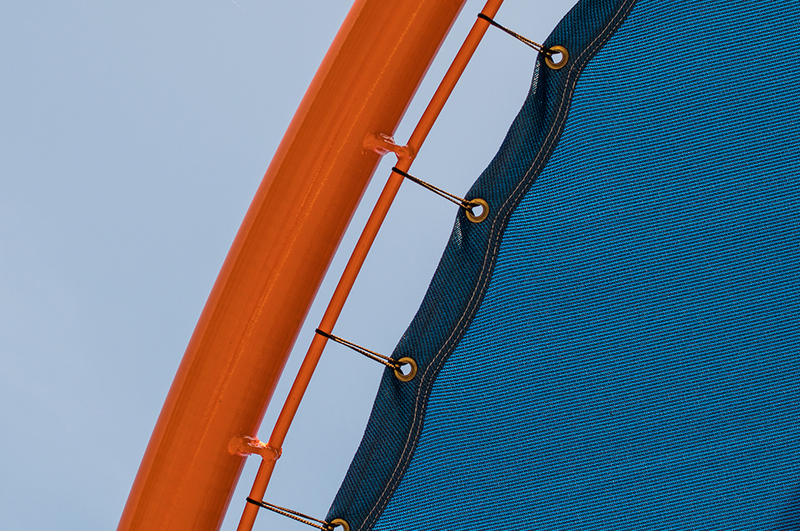 The Halo Disc Shade was made a standard product, so other parks will be able to enjoy this iconic shade structure without delays in engineering. “I’m very pleased with this shade. I’ve never installed anything like this in my life! This is by far the coolest shade I’ve ever put up,” Slifer said.